Diatonic Scale: Waterloo. The History of Four Days, Three Armies and Three Battles (2014). Waterloo. The History of Four Days, Three Armies and Three Battles (2014). Recently, as my nerd like interests inevitably dictate, I was interested in the uniforms of European soldiers of the 19th century and Bernard Cornwell’s (2014) “Waterloo : The History of Four Days, Three Armies and Three Battles” had interesting pictures, with paintings that included the one with the horses by Lady Elizabeth Butler (1881), as well as tactical maps with important looking rectangle designs and quite significantly, being paper back, was at the right price. It reads as a historical documentary with anecdotes derived from letters of the combatants and has tactical and historical considerations discussed by the author, Bernard Cornwell. As I am a schmlo with no military background or theory, but I did read a translation of Livy’s “The Punic Wars”, part of the Ab Urb Condita Libri in High School and I thus I feel I can give the humble opinion that I found “Waterloo : The History of Four Days, Three Armies and Three Battles ” to be quite enjoyable light reading, with much more solid theoretical basis than most of the episodes of Sharpe (1993 -1997) I saw on TV as a kid, but without the heroic visage of Sean Bean, which of course is a loss. 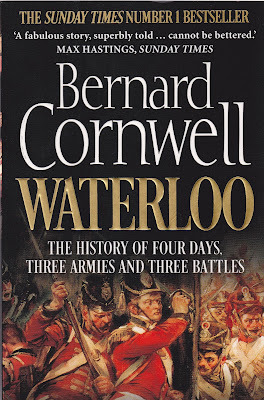 It is probably relevant that Bernard Cornwell wrote the books behind the “Sharpe” (1993 -1997) TV series, which at this time (2015) comprise 16 books. So he probably is an expert on this stuff, and apparently “Waterloo : The History of Four Days, Three Armies and Three Battles ” (2014) was published for the 200th anniversary of that particular battle, on the 18th of June 1815, The Second Treaty of Paris established peace on the 20th of November 1815. The Battle of Waterloo has a special place in the British public consciousness, the Duke of Wellington is perceived to be something of a national hero, the British contribution to that battle was significant and historically it was the battle that established the ascendancy of the Seventh Coalition in the Napoleonic wars. The subsequent Congress of Vienna resulted in a diplomatic system (the Concert of Europe) that saw the introduction of a period of relative peace on the European continent, right up to World War One in 1914. Of course this period saw the nation states of the European continent turn their industrialized gaze onto the rest of the world and is associated with a historically unprecedented degree of migration, one where 30 million Europeans traveled to the United States of America and resulted in the modern world we see today. 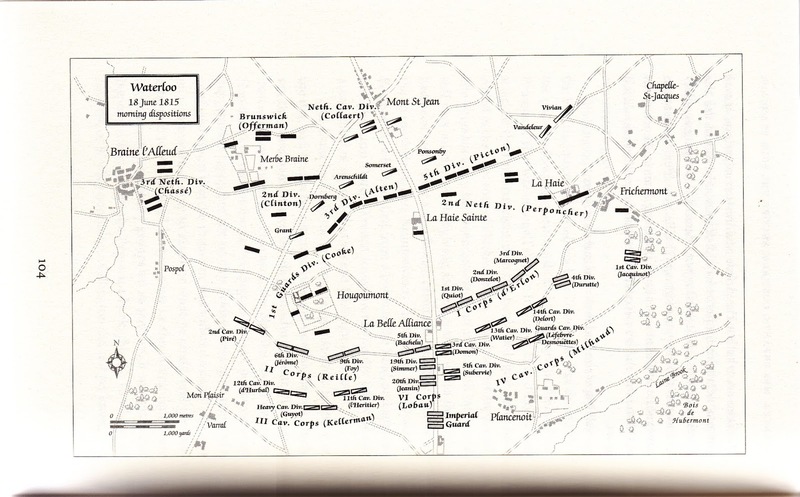 Waterloo, Morning dispositions page 104 : 2014 Cornwell. The battle produced military casualties totaling for all combatants around 52,000, 12000 dead on the battle field and around 40,000 to 50,000 wounded (321 : 2014 Cornwell). It can be estimated at least 30 % of the wounded died in the subsequent months, an estimation made from the British 32nd regiment, which had 28 dead, 146 wounded with 44 of the wounded dying in the following month (322 : 2014 Cornwell). British casualties were around 17000, around 3500 dead, 10200 wounded and 4300 missing. 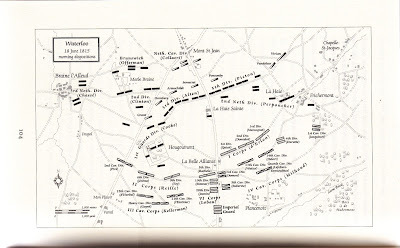 The Prussians whose movements over the course of three days had included a defeat at Ligny, retreat to Wavre and a flanking maneuver at Waterloo with vicious close quarter alley fighting at Plancenoit against a desperate defence by the French Young Guard, had suffered around 31000 casualties (321 : 2014 Cornwell). Cornwell estimates that around 30000 French soldiers were killed at Waterloo, Wikipedia estimates around 26000 with 7000 captured and approximately 15000 deserting. The name “The Battle of Waterloo” was decided by the Duke of Wellington, in French history it is known as the Battle of Mont St Jean and in German, showing the political evolution of the Prussian state into Modern Germany, as the Battle of the Belle Alliance, as decided by the Prussian General Blucher. Over time the Duke of Wellington tended to underplay the role of the Prussians, a combination of his first hand experience of the sacrifice made by his men and the role ascribed to him by a grateful British public that would certainly and understandably lead to a degree of vanity. 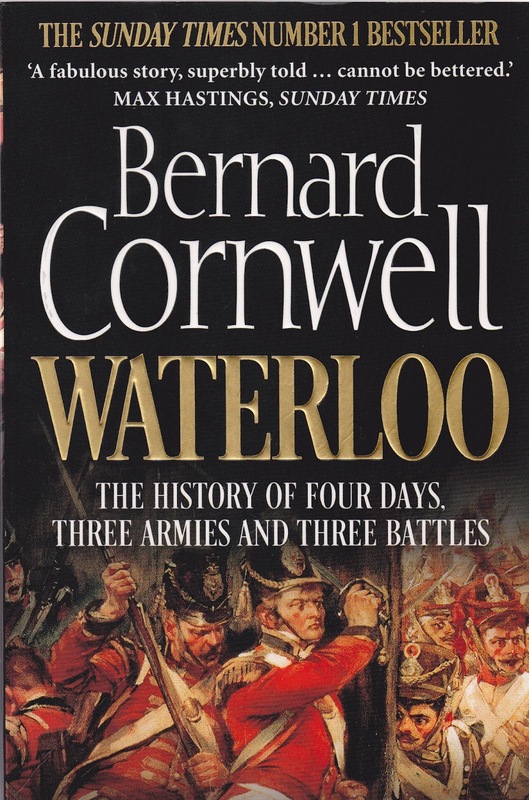 Bernard Cornwell describes the strategic situation of the battle in a succinct manner, Wellington made his stand because he was assured that the Prussians would be arriving, and the Prussians, under Blucher marched because they knew that Wellington was making a stand, if either did not remain faithful to their promise both would fail. Napoleon was making an assault on Wellington’s position, to break Wellington’s army before the Prussians could arrive (332 : 2014 Cornwell). The timing of the Prussians arrival meant that Napoleon was committed to the Battle and thus did not disengage in an orderly manner to fight another day at better odds. The victory at Waterloo, was the product of the ability of Wellington and Blucher to coordinate their armies and trust that each army would play their necessary role in the coming battle. Cornwell, Bernard. (2014). Waterloo. Published by William Collins. Printed and Bound in Australia by Griffen Press. Pages 104, 321, 322 & 332.